SEOUL, South Korea (AP) — South Korea’s president says U.S. President Donald Trump told him he has a “very friendly view” of North Korean leader Kim Jong Un and wants to grant his wishes if he denuclearizes. North Korea has sought security guarantees from the U.S. and relief from international sanctions. President Moon Jae-in’s office quoted Moon as saying that Trump asked him to convey those messages to the North Korean leader if he visits Seoul this year as he promised. Moon spoke to reporters on Saturday aboard his presidential plane en route to New Zealand from Argentina, where he met Trump on the sidelines of a Group of 20 Nations summit. “President Trump asked me to forward to (Kim) these messages; he has a very friendly view of Chairman Kim Jong Un and likes him. He hopes to fully carry out the remaining agreements (from their June summit in Singapore) together with him so that he will make Chairman Kim Jong Un get what he wants,” Moon said. 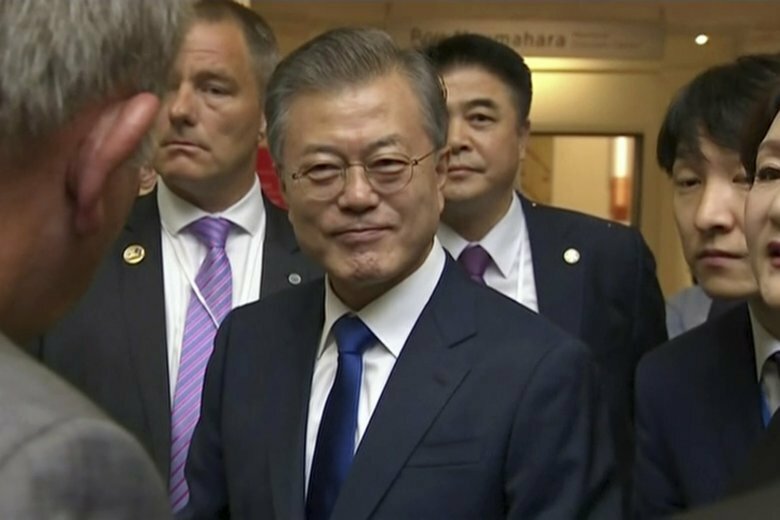 Moon said he and Trump agreed during their meeting that Kim’s trip to Seoul would play a “very positive role” in U.S.-North Korea nuclear diplomacy. Moon said it’s still unclear whether Kim will visit Seoul by the end of this year, and that it’s up to the North Korean leader. Moon, who has facilitated a series of high-level talks between the United States and North Korea including the Trump-Kim summit, has met Kim three times this year. After their third meeting in Pyongyang, North Korea’s capital, in September, Moon said Kim agreed to make a reciprocal visit to Seoul this year. Their two previous summits were held at the countries’ shared border village of Panmunjom. If Kim, a third-generation hereditary ruler, visits Seoul, he would be the first North Korean leader do so since the end of the 1950-53 Korean War. Moon said a visit would convey Kim’s commitment to nuclear disarmament, better inter-Korean relations and world peace. After sharply raising tensions with nuclear and missile tests last year, Kim abruptly reached out to Moon and Trump with a vague nuclear disarmament pledge. Subsequent nuclear diplomacy hasn’t made headway since the U.S.-North Korea summit in June. But both Moon and Trump say fears of war on the Korean Peninsula have eased sharply. Trump said on Air Force One while returning to Washington from Argentina that his next meeting with Kim would likely happen in January or February. He said there were three sites under consideration, but declined to name them.